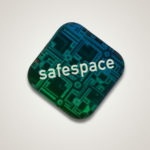 The SafeSpace Smart Patch attaches directly to your cell phone or other EMF-generating devices. You carry it with you wherever you go to help clear away and protect against the health hazards of electromagnetic radiation. 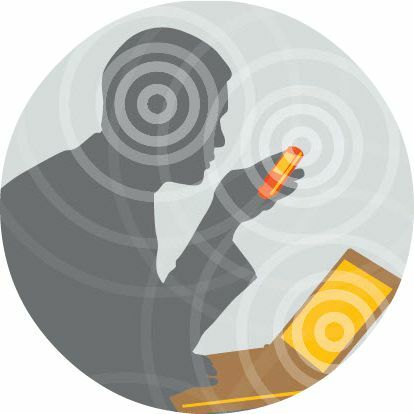 The laboratory-tested SafeSpace Smart Patch has been proven to transform and neutralize radiation from wireless technologies, electronics and appliances. The Smart Patch converts the interfering radiation, immediately sending a coherent life-enhancing field through the device. The patch’s non-electric metal substrate hologram has been permanently encoded with frequency information that interacts with and neutralizes the damaging effect of the incoherent energy from EMFs. When you affix it to the device, it begins to work immediately. It does not need to be replaced, and it works on devices stored inside cases. The patch radiates a six-foot protective field around the device to keep you crystal clear. For use on smart phone, tablet, laptop, electronic device or appliance. 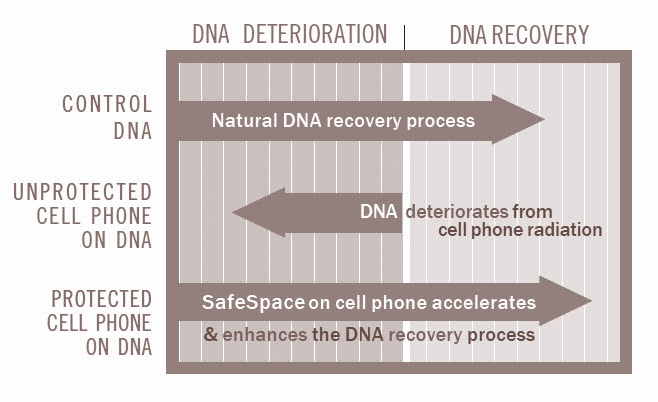 Testing the SafeSpace™ Smart Patch on human DNA at Quantum Biology Labs proved that the patch not only neutralized the detrimen- tal effect of the electromagnetic radiation on human DNA, it improved the DNA recovery process beyond the control. All SafeSpace products have a 30-day money-back guarantee. If you are not completely happy with the product, return it within 30 days for a full refund. How do I know if my device needs a Smart Patch? If it has an electric cord or a battery, it needs a Smart Patch. You can use a Smart Patch on your television, stereo and other entertainment equipment, surge protectors, laptops, tablets, routers, telephone, kitchen appliances, electric tools, large and small office equipment. How big is the Smart Patch? The size is 5/8" square and is designed on a thin holographic substrate with an adhesive backing so it can be placed inside the phone’s case or directly on the body of the phone. Can I use the Smart Patch with other SafeSpace products? To build on the benefits and further extend the harmonizing impact, you can use the patch along with other SafeSpace products. How does the Smart Patch work? The SafeSpace Smart Patch radiates a transformative field into your device’s circuitry at the source. It also creates a personal field of protection around your cell phone, laptop or other device. I have to use my cellular phone constantly, but I would feel queasy in my stomach every time I was on a call for a long period of time. Since putting on the Smart Patch, that feeling is gone. It’s made a huge difference! I personally know somebody in my office — a major cell phone user — who was diagnosed with a tumor on the side of his head where his phone would always be. It freaked me out. I know when I talk on my mobile for a while, I can feel the heat of it. But I’m a real estate agent with two teenagers, so ditching my phone is not an option, and the kids would never even consider it. So thanks for these Smart Patches. I’ve been looking for something like this, and it makes me feel good that you have actual research...I appreciate the work and research you’ve put into this. And your prompt shipping! I am electro-sensitive and have been having heart palpitations due to the bad wi-fi in the portable telephones and (routers for) computers and televisions...I used your SafeSpace Adapter. It corrected the smart meter (installed without notice) that started my health crises to begin with…Now the smart meter is no longer a problem!